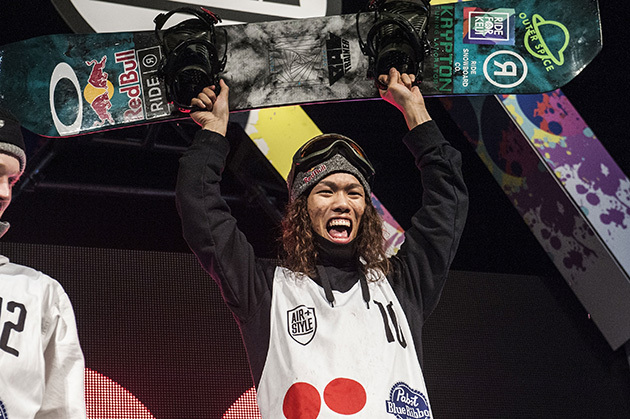 Already one of the best snowboarders to ever come out of Japan, 19-year-old Yuki Kadono—along with Ayumu Hirano and Taku Hiraoka—stands at the forefront of the influx of Japanese talent that has entered the fray of professional snowboarding competition in the past several years. In terms of marrying style and technical ability, Kadono is quite simply one of the best in the world. He’s made the Backside Triplecork 1620 his trademark trick and used it often on his way to his second consecutive Air+Style Los Angeles win and his first career X Games gold medal, also in Big Air. Through translator Miles Atkinson, SI.com talked with Kadono about his season, the future of stylistic and technical riding, the story behind his broken board in the Aspen Big Air final, the culture of snowboarding in Japan and more. You’ve had a lot of success this season. You’ve finished at the top of a few different podiums. What was the highlight of your season? The X Games Oslo gold medal, Aspen bronze or winning Air+Style L.A. for a second time? Yuki Kadono: X Games Oslo was one of the biggest moments of my snowboarding career. That was definitely the victory that meant the most. Aspen was a bronze and I had already won the L.A. stop of Air+Style during last season. RW: What tricks did you throw down to win each medal? YK: For Big Air Oslo, only one run—the best run—counted. On the run that won the gold medal, I threw a Backside Triplecork 1620. In L.A., two of three runs combined for the final score. The first run was also a Backside Triplecork 1620, but the second one was a Frontside Triplecork 1440. RW: Where did you feel you had the better performance and which format do you prefer? YK: The biggest difference from a tactical standpoint is that if it is only one run that counts, you can’t really show your individuality or variation; I can’t show that I have more than one technique. So because I do have more than one technique, I always want to throw different tricks in competition. I prefer the format that allows me to do so. Air+Style was probably one of the top performances I’ve had in my career, so I have to go with that in terms of my best performance this season. You broke your board in Aspen but still managed to podium. Tell me about that event and how it went for you. YK: I landed my first run to get comfortable in competition, then went for the win in the second and third runs with a switch Backside Triplecork 1620. I fell both times and broke a board each time I fell. I only carry two boards to competitions, my regular and a back up. At that point, I considered dropping out of the event right there, but I saw one of the riders, I don’t remember whom, throwing Frontside 1620s. I looked at the rider’s landing point, looked at my own board and decided I could probably throw it as well, even with the broken board, so I went for it. RW: What level of risk assessment did you factor into that decision? Did you think it had a 50/50 shot, more or less? YK: If I’d been calm, not in a contest situation, I wouldn’t have put it at more than a 10-20% chance of successfully landing that trick in those conditions. In the heat of the moment, with my adrenaline pumping, I wanted to go for it. I knew if I didn’t try I was going to regret it. I’m glad the board didn’t blow up on impact! That was the biggest concern. I knew I could spin, but I had to be very careful landing. You ride slopestyle and big air, but you’ve had much more success in big air. Is that becoming more your focus? YK: I don’t want to lean on either discipline. I want to reach the top of both. The joy that riding big air gives me is different than that joy I feel riding slopestyle. Big Air is all or nothing, one time. The stakes in those finals can be so high that I still get nervous sometimes in those competitions. Now that the Triplecork is the standard, there is much less room for error. Everyone is trying to do 1620s; I’ve seen people attempting quad flips. That intensity is like nothing else. In Slopestyle, you do still have to throw that big trick, but by the time you reach that final jump, you’ve already conquered so much. The course is long enough that I can express myself on all the different items. You can take a different line than everyone else. I really like that about it. RW: What do you think about big air being an Olympic event in 2018? YK: This season happened to be a really good one for me in terms of big air, but that’s just a coincidence. It wasn’t because of the announcement about Olympic Big Air. My big air just happened to be stronger than my slopestyle this season. I wish I could have had equal success in both. The Olympics is obviously a goal now, but it’s no different from any other contest. I go into every contest I compete in looking to win. I need to keep evolving my tricks so that they are adaptable to slopestyle and big air. I will say that I really enjoyed the experience of winning the first A+S Los Angeles. I’d love to win the first Olympics as well. RW: You have built a reputation as one of the most progressive snowboarders around, but you also add style to everything you do. What’s the secret to staying at the forefront of progression and making it look so good? Maybe this isn’t so good to say, but I’ve noticed that some riders have a formula for their tricks. They go into them with a certain speed, rotate their bodies at exactly this timing; they know exactly where they should be looking mid-flight. I don’t have any of that. In slopestyle, I have a mental image of landing, but otherwise I just go with the flow and see what I feel. My instinct kicks in and my body just goes with it. In big air, I think about the tricks a lot more. I think it’s because I master tricks in big air and don’t bring them into slopestyle until I’m very comfortable doing them. That’s probably why it seems like there is so much style even in my more difficult tricks. RW: Talk to me about the culture of Japanese snowboarding. You are a big name, but just one of many who have entered the event realm in the past decade or so. How big has snowboarding gotten in Japan? Japan in international contests. Snowboarding has gotten fairly popular in Japan over the last decade, and that’s led to more competition-level riders over the last two to five years. RW: Who are your biggest inspirations in snowboarding? YK: I didn’t have one particular rider, or any rider really, that I grew up watching or modeling myself after. I used to have my father film me as I was riding and watch myself day after day. I only started caring about what other riders were doing after the Triplecork made its debut. In the beginning, I needed to see how others were doing it to get the concept down. Before that, it was just me. RW: A+S and the Burton U.S. Open are the events you consistently do well in. Which competition do you prefer: the natural conditions of Vail or international and urban nature of A+S? YK: I like the cityscape and the natural scene for different reasons. In terms of the contests, I like the exposure of the city. More people can come watch the contest in areas like cities. The fans give me energy and always make a contest more fun. The natural mountains are less accessible and probably less fun for the fans, but I’m able to give my all. At the bottom of the run, I’m out of breath. Nothing matches natural snow. RW: What’s the next big idea in your head to push the limits? YK: Riders are already doing quad flips. Max [Parrot] just landed the 1800 earlier this season. So I’d like to land a Quadcork 1980. I’m not saying I’ll do it, but in terms of pushing progression, that does seem like the next logical step.